I prepared this soup last evening so that I can have an early morning start. It seems such a luxury to be making soup purely out of asparagus tips but I am using up my bulk buying from the wholesale vegetable market. 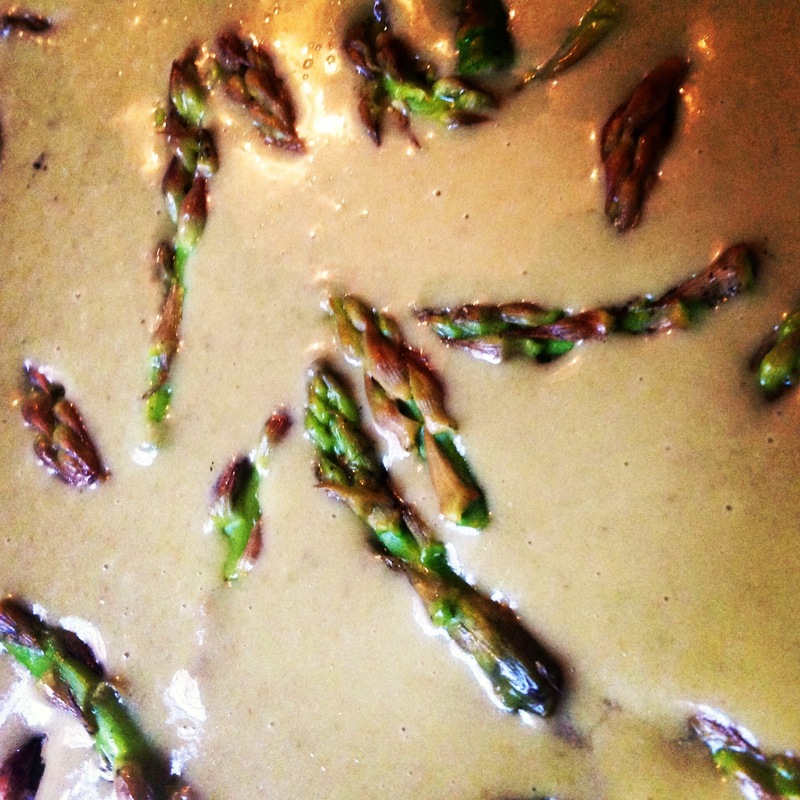 I am not giving quantities with this recipe as I was lucky to have an unrealistic amount of asparagus this time and you must remember that there is no magic formula with this type of purée soup but simply use what is conveniently available. This is a quick to prepare meal and I am serving mine with fresh croutons and Parmegiano Reggiano. In a large pot, place the onion, garlic and potatoes in the vegetable stock. Add enough water to cover the vegetables well. Bring to a boil, simmer and cover. When the potatoes have softened, add the asparagus but keep some aside to add later. This gives the soup more crunch and texture. 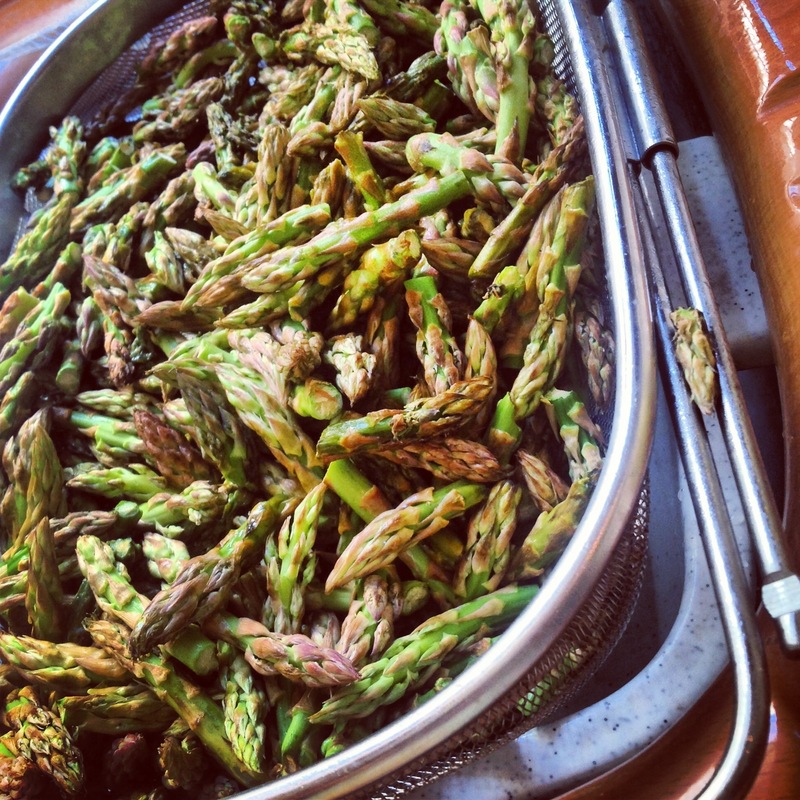 Cover pot and allow the asparagus to cook and soften in the steam for not more than 5 minutes. 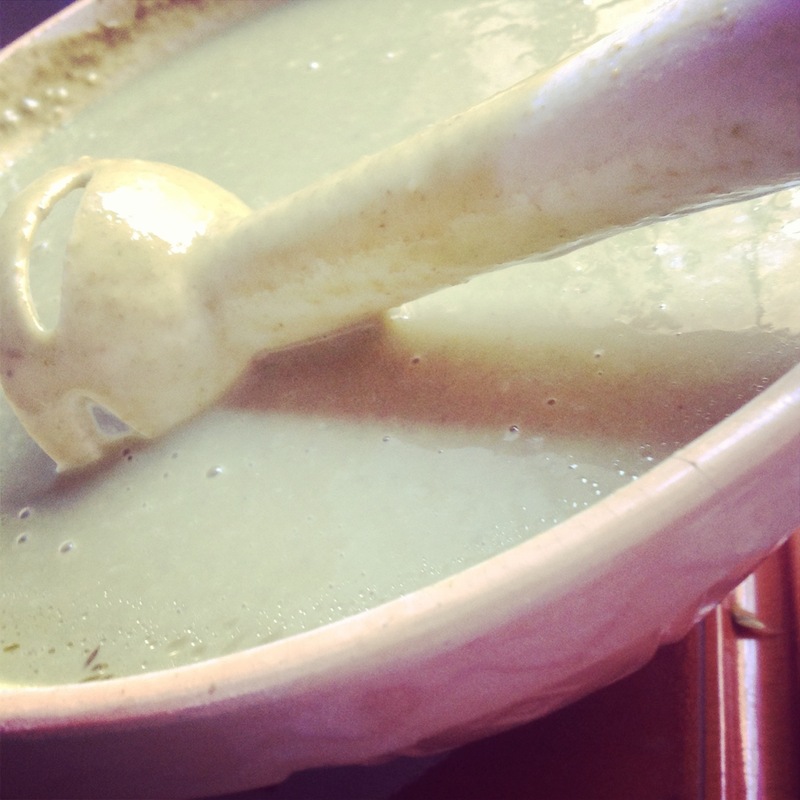 Allow to cool and use a hand held blender to make a purée. Add the single cream and Parmegiano Reggiano and blend further. The blended Parmegiano gives it a wonderful flavor. If the soup is too thick, add skimmed milk and blend until it reaches the consistency that you like. Finally add the butter, just a very little and you can leave this out completely, but I think it rounds off the flavor beautifully and gives it a smoother texture. Season with freshly ground pepper and Maldon Salt. In a saucepan cover the bottom with water and bring to a boil. 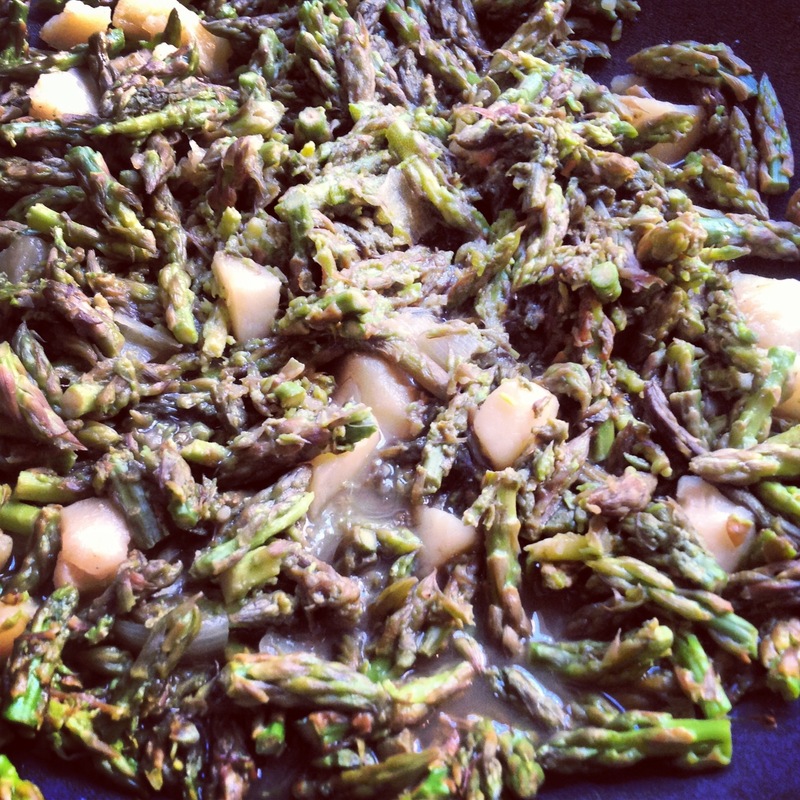 Add the asparagus that you have kept aside. Cover and steam the, for a few minutes only so that they retain their color and crunch. Add to the pureed soup. You can leave overnight in the fridge as the flavor improves and serve the next day with a garnish of fresh croutons and grated Parmegiano Reggiano. The asparagus with the potatoes, onion and garlic before blending. ← Gluten free Polenta Drizzle Cake with Mediterranean lemons …..divine…. looks amazing! so want to try it! Thank you Jesse, let me know how it turns out ! this time of year soup just feeds the soul, doesnt it? i love a quick and easy one. This is quick, easy and so nutritious, let me know how yours turns out !